Most of the Mekong Delta is as flat as a sheet of rice paper. But my favourite corner of the region, the western edge along the Cambodian border, is blessed with some high ground. 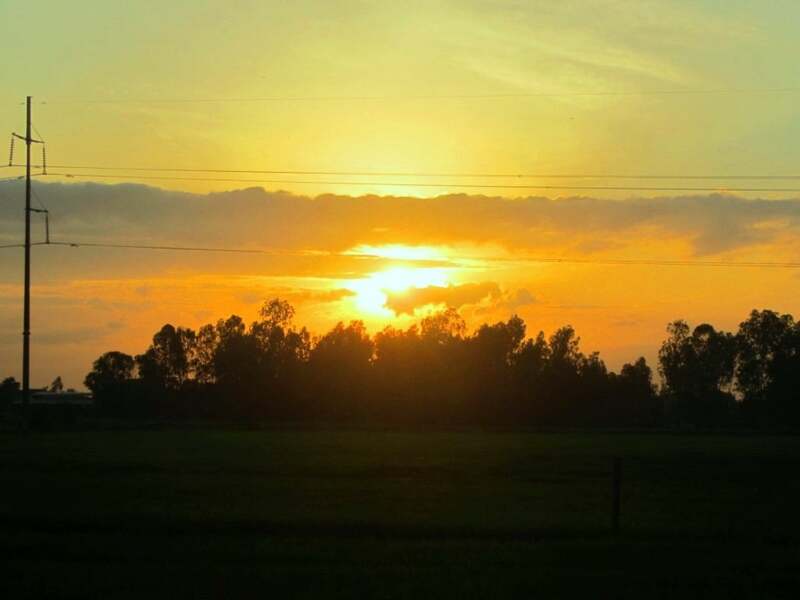 In An Giang Province, a diminutive mountain range rises from the vast agricultural plains and wetlands of the delta. Being geological oddities in the landscape, it’s perhaps not surprising that these mountains are considered sacred. They are also rich in history (both ancient and modern) and shrouded in myth. Beautiful back-roads connect each of the mountains and, in some cases, extend right to their summit. 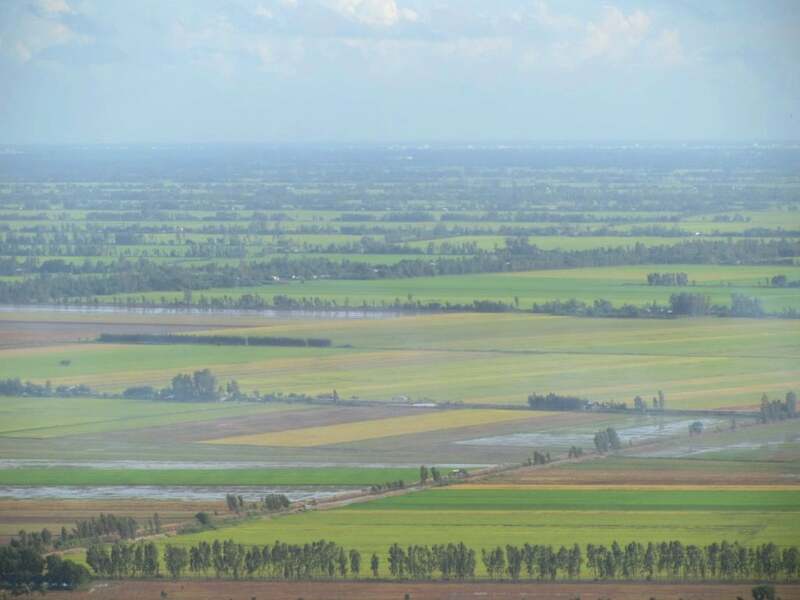 The scenery is the most dramatic in the Delta, and, because the surrounding area is so flat, the views from the peaks are immense. 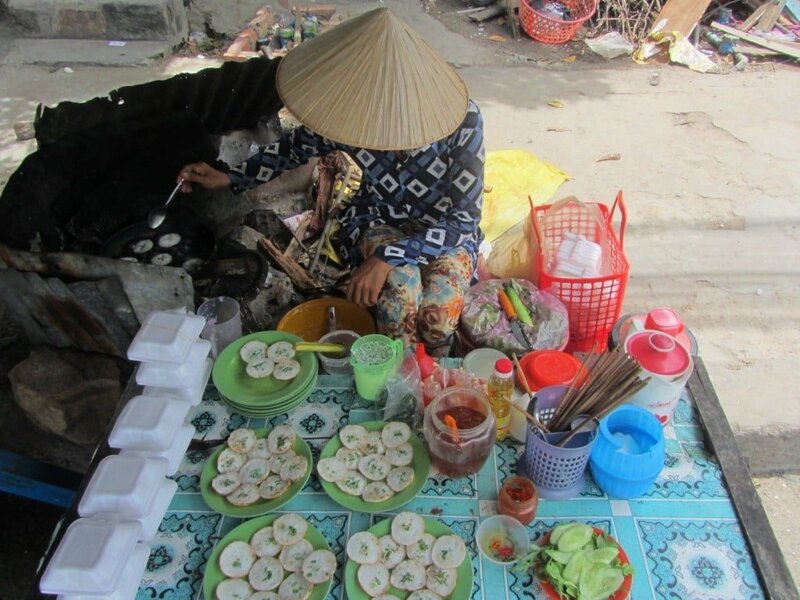 Off the beaten track towns – full of great street food, friendly Khmer people, and Theravada Buddhist temples – dot the region, making this easily accessible loop a rich and rewarding excursion from Saigon. I call it, Mountains in the Mekong. This road trip starts in Saigon, loops around the western corner of the Mekong Delta, and returns to Saigon via a different route. As main roads in the Delta can be busy and dusty, I’ve chosen alternative routes whenever possible. This makes for a much more pleasant experience of riding in the Mekong. The total distance is 600km and I’ve divided this guide into 4 sections. 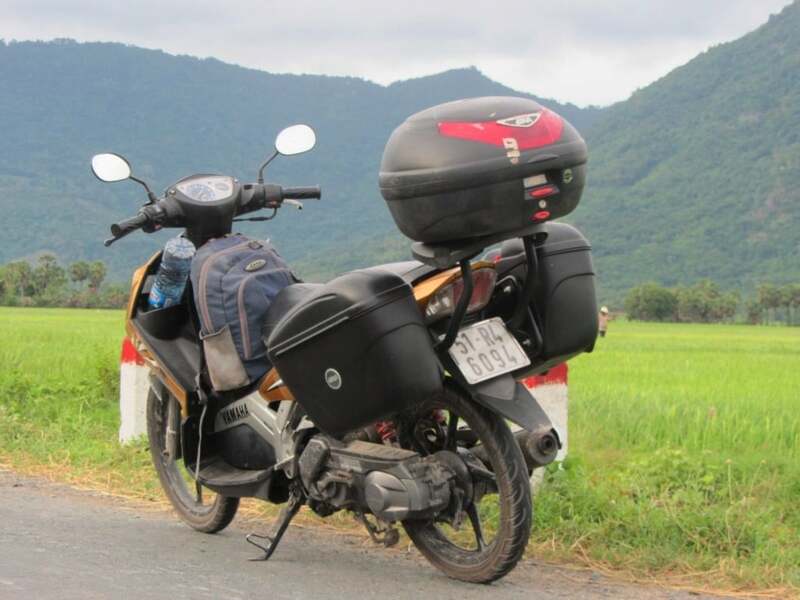 The short hops between mountains in An Giang Province are easy and quick (sections 2 and 3), but getting there and back from Saigon takes a long time (sections 1 and 4). However, this road trip breaks down nicely into easily manageable chunks: between ferry crossings, bridges, towns and, of course, mountains. Because the mountains are considered holy and are home to many temples, they get busy with pilgrims and domestic tourists on weekends, national holidays and ‘moon days’ (1st and 14th/15th of the lunar month). This is great for a carnival atmosphere but bad for crowds and litter. If, like me, you prefer your sacred mountains to be peaceful and quiet, visit on a weekday afternoon. Any time of year is good, but the colours are best in the rainy season (May-October). In the guide below, I’ve described each section of the road trip, including information about food, drink, and accommodation along the way, and a route map. Leave Saigon early: between 4:00 and 4.30am. This is the hour of baking bread. The smell wafts through the city as vendors begin to populate the dark streets, bringing their wares to stalls in the local markets. But, most importantly this is the last hour before the traffic wakes up, at 5:00am. 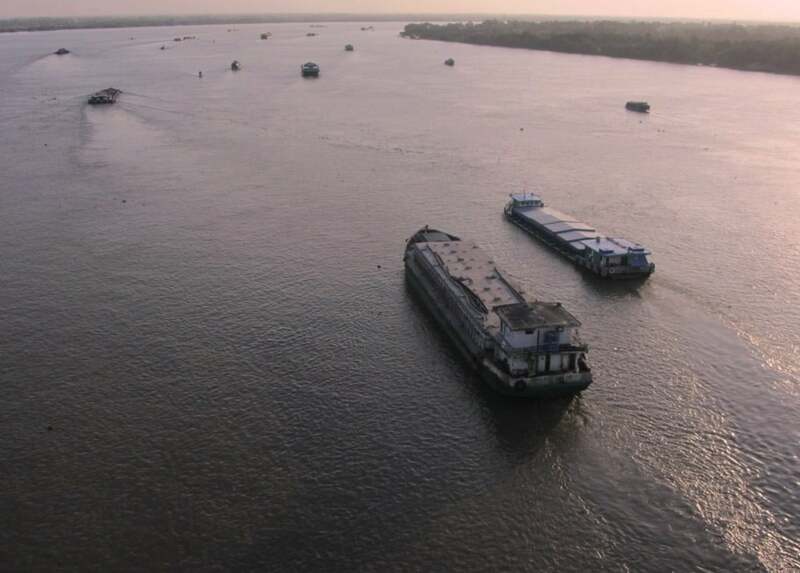 Leaving early is the smart thing to do, because getting to the Mekong can be exhausting, traffic-clogged and polluted, so get it over and done with before the dust and trucks all get going. The first 10km of Highway QL50 are in bad shape, with treacherous potholes and terrible lighting. But it’s not long before the silver dawn shows in the east, the road becomes perfectly paved, the traffic dissipates, and the smell of damp and a chill reach you from the flooded paddy fields: your road trip has begun. The first riverine vista is from the brand new My Loi Bridge, and it’s mighty impressive. Most landscapes look their best at dawn and dusk, but this is especially true in the Mekong Delta, where the low light picks out shapes and details, and sculpts the ripples on the water, creating a landscape which disappears once the sun is high. It doesn’t matter how many trips I make to the Delta, I’m always amazed at how busy the waterways are. Barges, fishing boats, freighters, ferries; a constant stream of slow-moving river traffic. 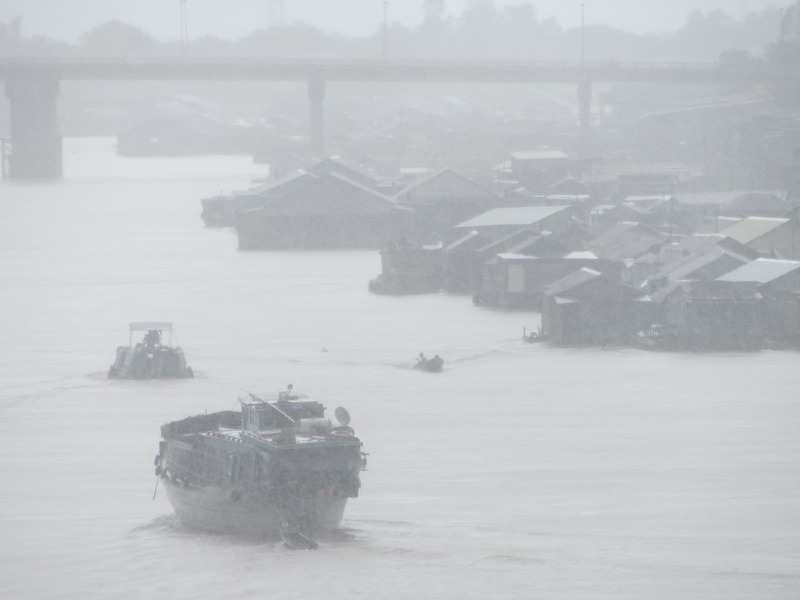 After the bridge, the delta really starts to open up: the sun-drenched, rain-soaked, river-brimmed, fruit-full, rice-carpeted, people-populated Mekong River Delta. At this time of the morning, the colours between Go Cong and My Tho are blindingly bright. After stopping for a snack and coffee in the cheerful streets of My Tho, head over the wide and many-armed Tien Giang River (Upper Mekong), by way of the Rach Mieu Bridge. This is the first of many Mekong River crossings. At the end of the bridge, turn right (due west) onto Road DT883. 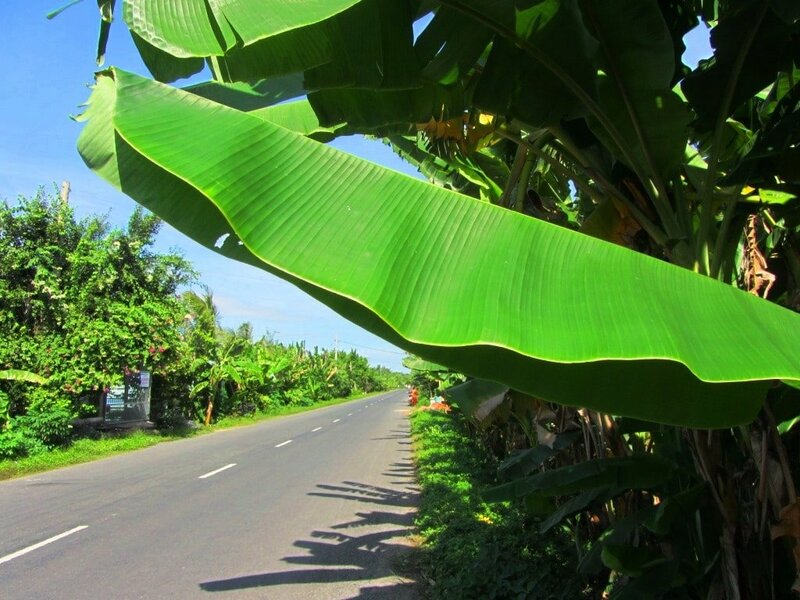 This is a lovely, quiet back-road ambling through fruit orchards – banana, mango, longan berry, jackfruit, rambutan, breadfruit, papaya, coconut, tamarind, guava, areca nut, tropical almond – with their branches drooping over the roadside. Coconut husks, the colour of fired clay, look like piles of pottery under the palm trees from which they’ve fallen. From here to Vinh Long, there are two ferry crossings, each costing a handful of dong and lasting a few minutes. This adds a nice, leisurely rhythm to the ride. However, after joining Highway QL80 from Vinh Long to Sa Dec, it’s all dust, trucks, honking and heat. 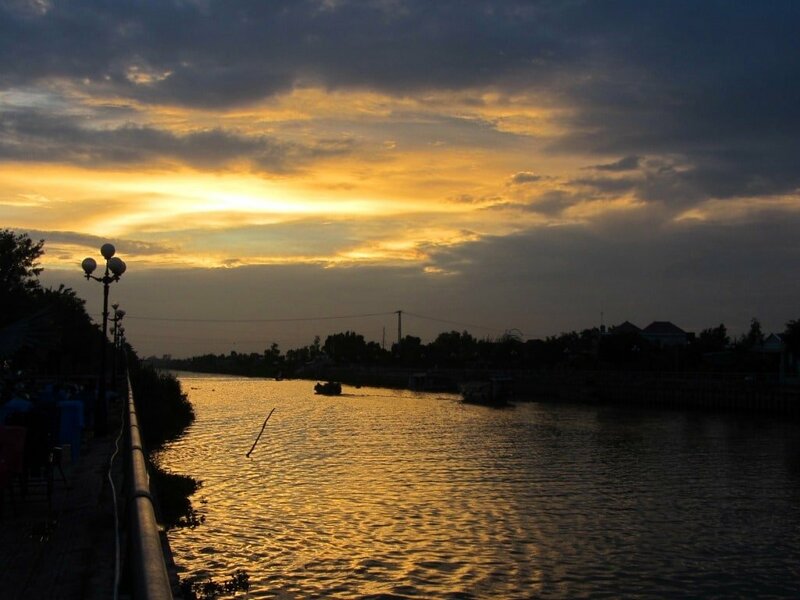 A quick riverside drink in Sa Dec should be all it takes to recover, before rejoining QL80 and criss-crossing the countryside to the Vam Cong ferry crossing to Long Xuyen. A new bridge is currently under construction to replace this ferry, and not a minute too soon, judging by the awful queues and chaos when boarding: it’s a mess. The city of Long Xuyen is a bit of a mess too, but in a busy, bustling, endearing Mekong Delta kind of way. There’s plenty to eat and drink, and accommodation options include the Hoa Binh 1 Hotel, offering good mid-range value ($35); there’s even a small pool and rooftop bar. There are several decent nhà nghỉ (guesthouses) on the main street (Tran Hung Dao) as it passes through the town centre. 25km southwest of Long Xuyen, Nui Sap (also known as Thoai Son) is the first, and the smallest, of the mountains in the Mekong. Even so, it comes as a great relief to see some high ground after 250km of travelling over flat plains, where the bridges over the Mekong River are by far the highest points around. (The first few kilometres from Long Xuyen were bumpy and dusty at the time of research, due to the resurfacing of the road. However, these works should be finished by the time you read this.) The first thing you realize is that, in the Mekong Delta, it doesn’t take much to be called a mountain: at 85m high, Nui Sap is a hill by most standards. However, because the entire region is so flat, any rise affords tremendous views over miles and miles of landscape. There’s also a special thrill about climbing up and out of the busy, humid, populated and dusty delta plains, and into the quiet, peaceful, breezy and fresh climes of the ‘mountain’. And this transition happens very quickly, because the road leading up the mountain is very steep indeed. A smattering of pagodas, temples, shrines and tombs line the way, and there are a few refreshment shacks too. The mountain is made up of gigantic boulder piles, some of which are hidden amongst the foliage by the side of the road; great for sitting atop and gazing out at the views. The road stops just short of the summit. From here there’s a near-vertical metal stairway to the top. The vistas from the rugged, root-tangled peak are superb; looking over a vast patchwork of agricultural plains, criss-crossed by canals, the whole landscape streaked with plumes of smoke from burning crops. But, be warned, the stairs are extremely unstable: some steps are on the point of collapse, and it’s a shame about the litter at the top too, but what’s new?! On the way to the second mountain, you leave the beaten path far behind. The road gets narrower, children shout ‘’ello!’ as you ride by, and intriguing wooden homes with blue porches appear along the banks of the canal. Nui Ba The (221m) rises above Oc Eo town, once an important port of the Funan Empire, between the 2nd and 7th centuries AD. This is one of those places where, although hardly anything remains of that lost civilization, you can still feel it in the landscape and in the air: there’s just something about this area, even if you weren’t aware of its history. And so too, there’s something about Nui Ba The. A narrow lane, draped in foliage – bamboo, pagoda plants, eucalyptus, hibiscus – corkscrews up the mountain from behind Oc Eo market. 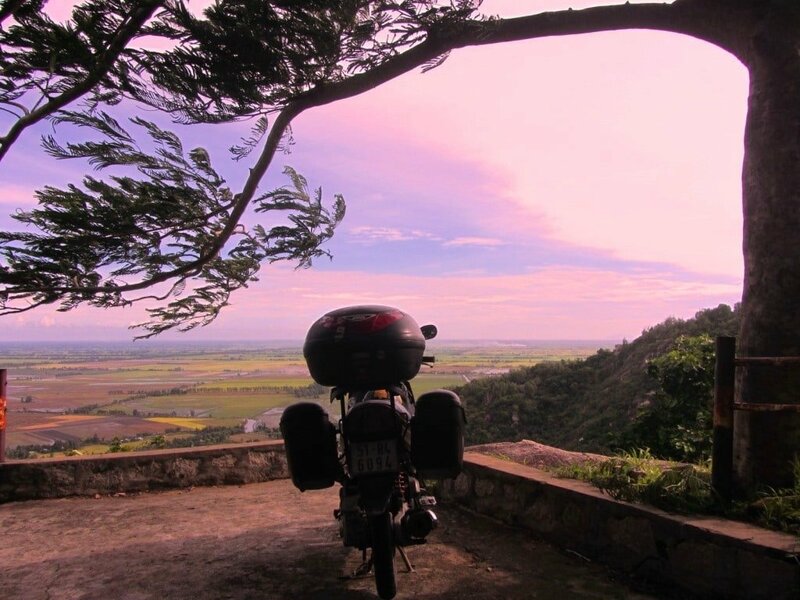 A breeze cools the air as the road gets ever steeper and, suddenly, the entire delta is at your feet, stretching out for miles into the distance; into the hazy mirage of Cambodia and out to the glistening waters of the Gulf of Thailand. Get here between 3:00 and 6:00pm on a clear weekday afternoon and it’s an enchanting place to be. 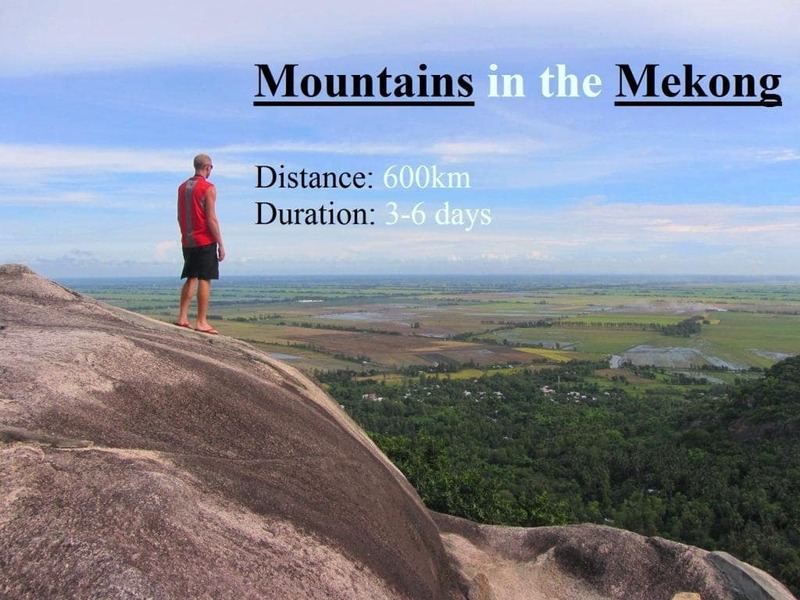 Large boulders make excellent viewing platforms, and there’s a gazebo at the summit with extraordinary panoramic vistas: you can see all the other mountains in the Mekong, forming a chain, like beacons marking the boundary of the limits of a forgotten kingdom. From this height, the Mekong Delta is but a garden of green and beige, bisected by water features. There are temples, sacred grottoes, tombs and a mountaintop monastery, where young men in their early twenties invite you to tea and tell you they intend to stay here till their dying days. Back down at the Oc Eo market (a great place for street snacks at dusk), in the shadow of the enchanted mountain, it’s difficult to reconcile the difference in feeling between here, on the dusty roadside, and up there, on the windy summit, just 5 minutes away. At the first crossroads before the market, there’s a permanent exhibition displaying Oc Eo artifacts and photographs of the excavations. It’s nicely presented, but there’s not much to see and only bits of information about the people and culture that inhabited this area 1,500 years ago. Nhà Nghỉ Út Mập (0766 551 949) is a decent enough guesthouse near the base of the mountain for one night (150-200,000vnd). The road to the third mountain is very pretty (following a canal shaded by large tropical trees), but also very bumpy for the first 10km. In wet weather it might even become impassable. But, in dry conditions, it’s a minor inconvenience which just slows you down a bit. The road surface improves as it approaches a large canal port which deals with all the stone that’s being quarried from the mountains behind. Bear left for a beautiful little road which loops around the bottom of Nui Co To (614m) and Tuc Dup (216m) mountains. It’s lovely and lush at the foot of the mountains, with rice paddy, eucalyptus and exotic-looking sugar palms. The area is dotted with decaying old Khmer shrines, standing on little islands in the fields, overgrown with epiphytes. Other religious buildings have more vigour: Khmer temples painted in bright and brilliant colours, and lavishly decorated Khmer cemeteries with mini stupas poking above the foliage. This region was once part of lower Cambodia, until it was gradually annexed by the Vietnamese in the 17th and 18th centuries, and there is still a large Khmer population here. Signs are in the Khmer script and some of the older people I stopped to talk to didn’t understand or speak any Vietnamese at all; their mother tongue was Khmer. There’s a tourist park on the west side of Tuc Dup Mountain but it’s not really worth stopping for. Continue around the mountain to Tri Ton, a surprisingly bustling and very likable little town with a pretty good guesthouse (Nhà Nghỉ Tú Trinh, No.68, 3/2 Street; 01646 776 448; 180-250,000vnd), a large Khmer temple, and lots of food. Try the bún thịt nướng (a cold noodle salad with marinated pork) and gỏi cuốn (fresh spring rolls) at 101 Tran Hung Dao Street; Ms Hồng has been serving them for over 20 years. Or check out the fabulous, old-style food court in the central market, especially for breakfast. Seats are laid out beneath the fading market building with crumbling plaster pillars. Food and drink vendors are dotted around the perimeter. It’s worth a trip and a night here just for this. Tri Ton is a great little town for a night of off-the-beaten-path charm. 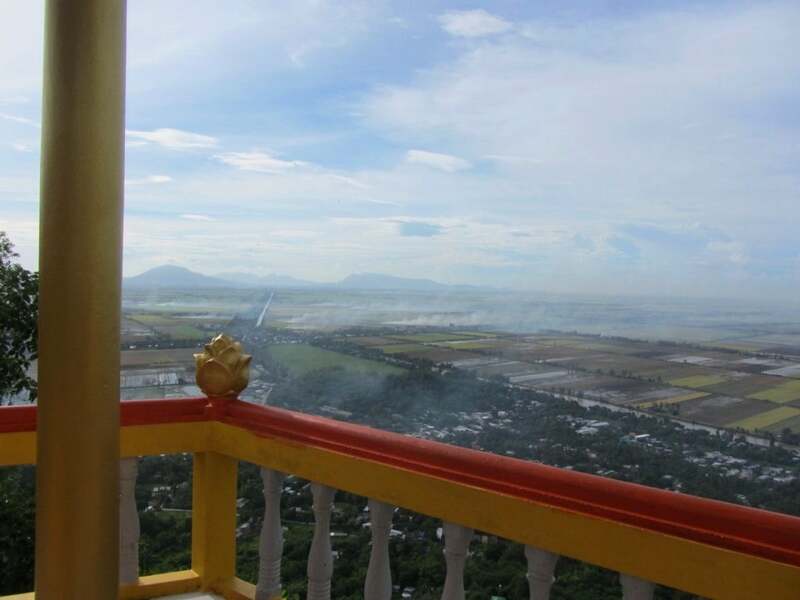 Nui Cam, meaning ‘Forbidden Mountain’, is the highest of the mountains in the Mekong (716m). 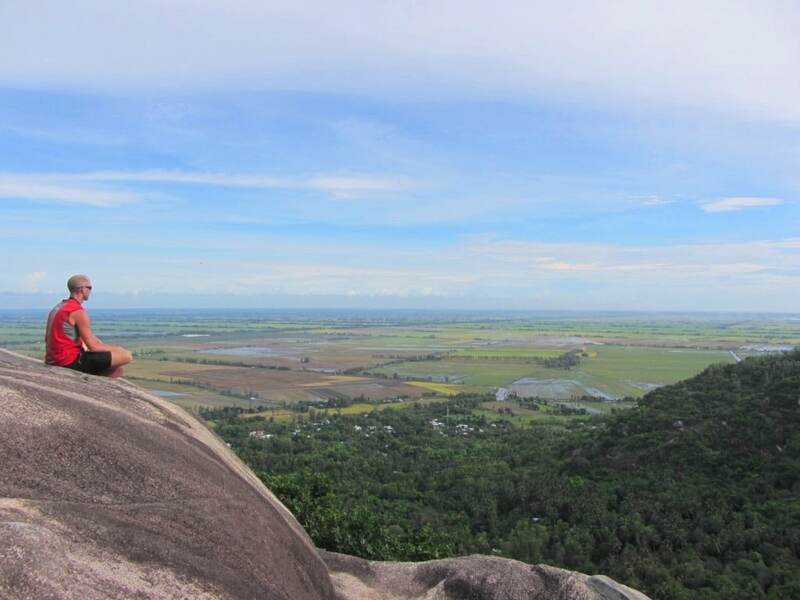 It forms the bulk of a small chain of forested hills near the Cambodian border, known as Bảy Sơn; Seven Peaks. 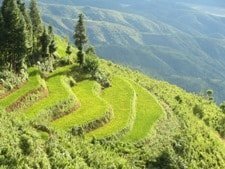 All of the Bảy Sơn Mountains are forested, which makes a welcome change from the ploughed, cultivated fields of the plains. With all the high ground around, it doesn’t feel like the Mekong Delta at all, and this is definitely the most scenic corner of the entire region. As there are several roads, a footpath, and a cable car leading to the top of Nui Cam, it could hardly be described as ‘forbidden’. However, you might find it lives up to its name on some days, when the road is closed due to rock falls (an incident in 2012 killed several visitors) and it’s forbidden to drive up. But there’s always the option to hike or take the cable car (155,000vnd return; 7am-5pm) instead. 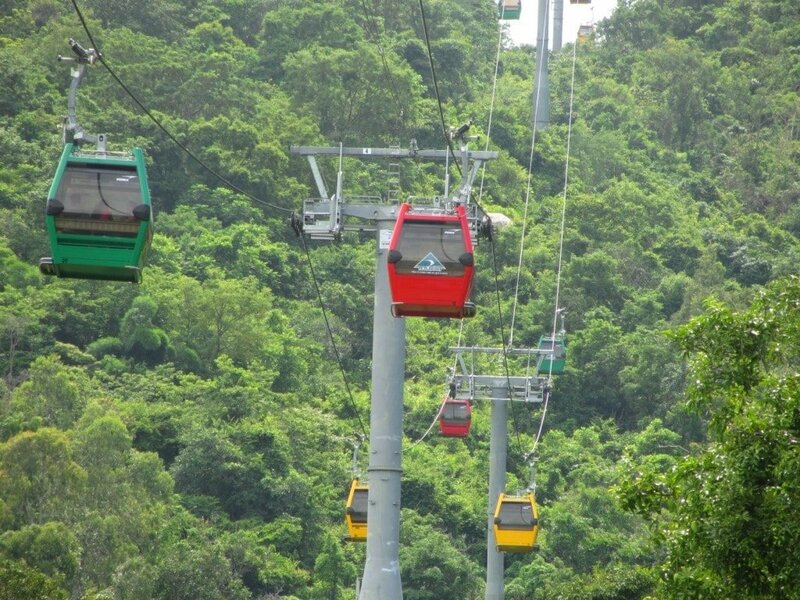 The latter has quickly become a Vietnamese tradition, which recently reached its ultimate manifestation when a cable car to the top of Mount Fansipan, Indochina’s highest peak, was opened. The cable car’s greatest asset is that it’s quiet, so you can hear the birds singing and the leaves rustling, and even smell the flowers, from the canopy below. However, it can get very windy near the top and, consequently, very scary; the wind howling through the cables and the car swaying violently. 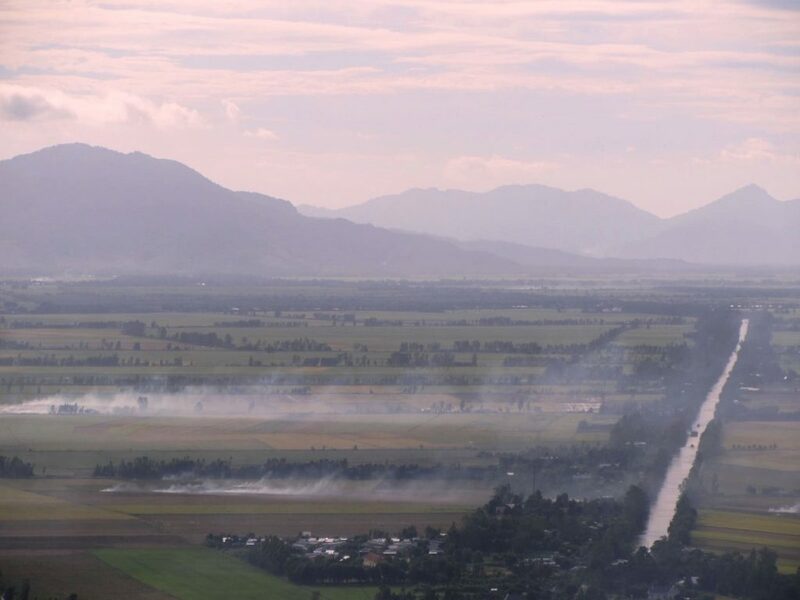 The top of Nui Cam is a bit of a tourist trap. It’s a huge complex of brand new religious structures and tourist tat, including a colossal statue of Buddha, a multi-storey pagoda, and a lake full of carp. All this comes with a lot of hassle – to buy fish food, take moto-taxis around the sights, and buy useless trinkets. 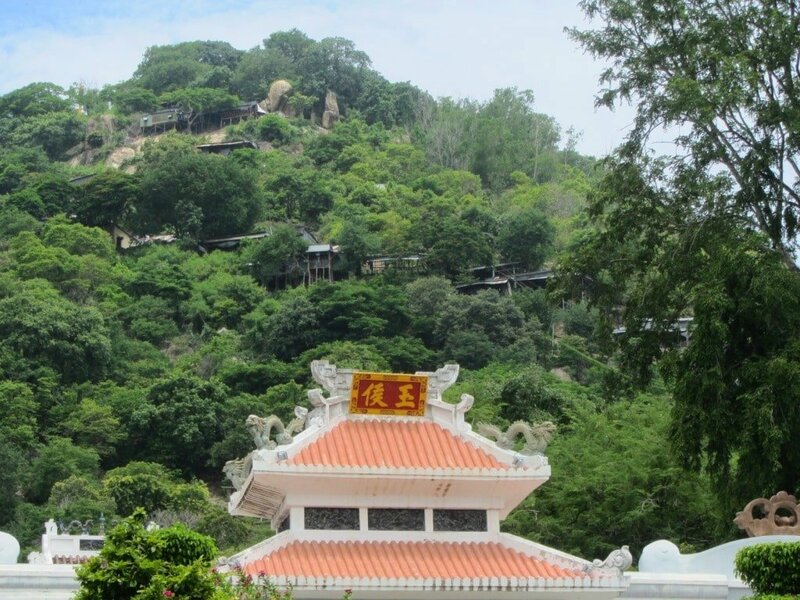 The Van Linh Pagoda is the most interesting of the attractions, because it’s a living monastery where you can watch all the daily Buddhist ablutions taking place. Most frustratingly of all, there’s no easily accessible place to look at the views: you have to pay a moto-taxi to take you up to the electricity pylon at the summit. There are some guesthouses (nhà nghỉ) on and around the mountain but it’s much nicer staying in Tri Ton. The back-roads leading around Nui Cam are fascinating and beautiful. Between 1975 and 1978, many Cambodians fled across the border to this part of Vietnam to escape the Khmer Rouge. Today, it feels like a Khmer state within Vietnam: almost everyone I met had Cambodian heritage and talked nostalgically about their native country. Even the landscape reminds me of the southern Cambodian plains, which, of course, are close by. From late afternoon, rustic shacks open at the side of the back-roads, offering excellent food to locals at the end of a day’s work. 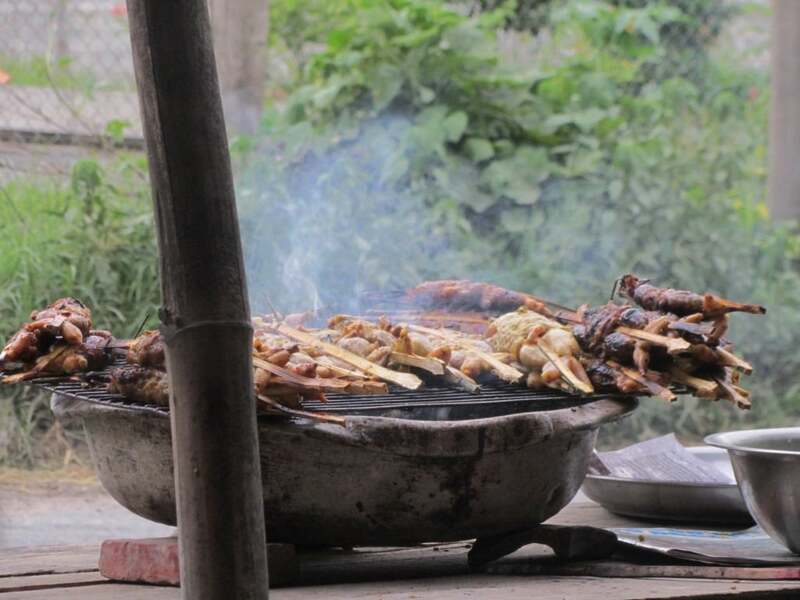 I came across a wooden shed selling delicious grilled frogs stuffed with lemongrass, and half a dozen soups, including pumpkin blossom and bamboo. Also available by the road is thốt nốt, a refreshing drink made from the fruit of the lontar sugar palm, which grows in the fields here. It’s also worth noting that, in all towns in this region, there’s a lot of vegetarian food (cơm chay) available, to cater to the monks and practicing Theravada Buddhists, which is a ‘stricter’, more conservative branch of Buddhism practiced by the Khmer people. Ba Chuc village sits below a small hill, just a few kilometres from the Cambodian border. In April 1978, the Khmer Rouge, in one of many cross-border raids into Vietnamese territory, massacred 3,157 people here. Men, women, children, babies; all but two of Ba Chuc’s villagers were murdered in the space of 12 days, using bludgeons, sticks and knives. 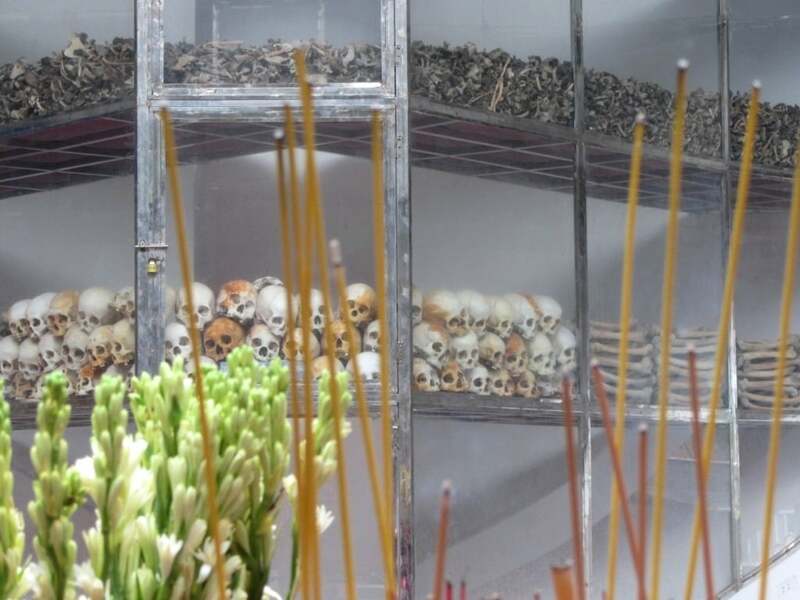 Today, the bones of the victims are housed in an ossuary, shaped to resemble a lotus bud. The remains are divided into skulls, leg bones, and pelvises, some of them clearly showing where they’ve been struck by their attackers. Bones are further separated by age and gender. Signs read like this: Children; 3-15 years old; (264). The figure in brackets indicates the number of dead in that category. Because the structure is open to the elements on all sides, there’s a strangely but, I think, reassuringly, informal atmosphere about the place. The adults stand, walk and ponder the atrocities committed here, while their kids and grandkids play hide and seek behind the pillars. This is typical of other such sites in Vietnam, with the notable exception of Ho Chi Minh’s mausoleum in Hanoi, where a sombre mood is mandatory. 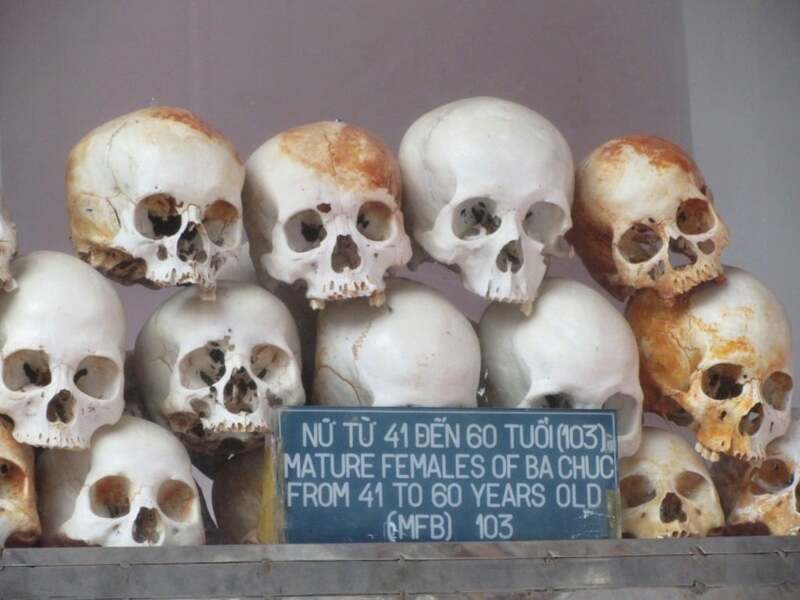 At the small museum next door, the extremely disturbing photos, taken just after the massacre, show that the people of Ba Chuc were not simply murdered; they were horrifically and unimaginably tortured first. Dozens of villagers took refuge from the killing in the back of the Phi Lai Temple. But their god didn’t save them. When I visited, renovation work was underway, and they were still scraping the dried blood from the walls. In January 1979, the Vietnamese army entered Phnom Penh, ending the reign of the Khmer Rouge. The dyke road from Ba Chuc to Nui Sam, lined with tamarind and eucalyptus trees, runs flush with the Cambodian border. The two countries are separated by a canal. There’s always something compelling about looking across a border into another country. On the other side, you can see the pointed tops of Khmer temples in the paddy fields and on the hillsides. At Tinh Bien, the main border gate in the area, there are several enormous markets selling all sorts of goods from Cambodia and Vietnam. There’s also lots of street food, making this a rewarding lunch stop. The most famous and most decorated (and therefore, I suppose, most sacred) of the mountains in the Mekong, Nui Sam (284m) rises from the rice fields just west of Chau Doc City, on the banks of the Lower Mekong River. Its steep, rocky slopes are covered in temples, graves, shrines, grottoes, pagodas, churches and other places of worship. 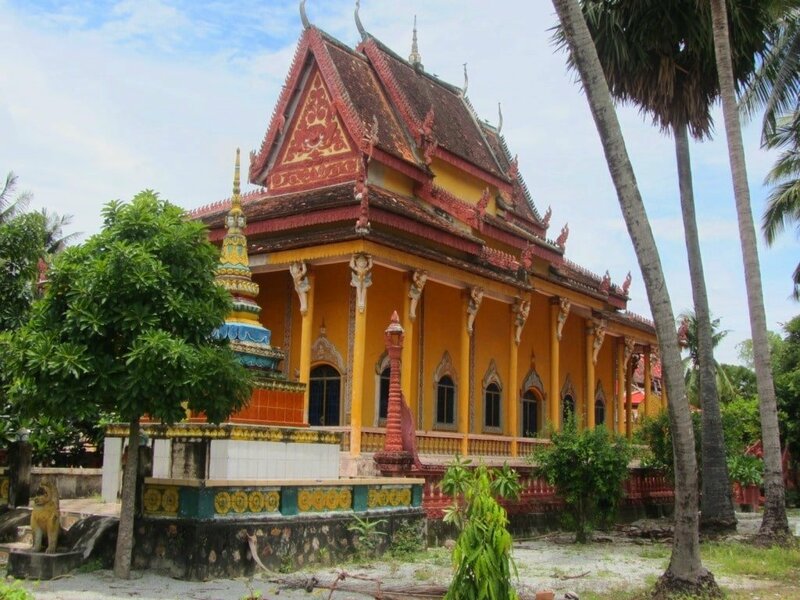 Despite its fame, Nui Sam is one of the smallest mountains in the Mekong, which means that all the religious structures vie for space on the crowded hillside. And so too do the pilgrims; millions of them each year. All around the base of the mountain, you’ll find food and drink outlets, trinket stalls, and small hotels. 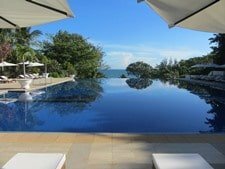 But, unless you’re staying at the spectacular mountaintop Victoria Nui Sam Lodge (excellent value at $50 a night during the low season), you’re better off overnighting in Chau Doc. It’s a bumpy ride up to the top; the road could definitely do with being repaved. There are refreshment shacks all the way up to the shrine at the peak, from where there are big panoramic views (even the Mekong River looks like an insignificant backwater from up here). It’s pleasant enough but a bit tatty and rundown. Choosing which shrines to pop into on the way up and down isn’t easy as there are so many of them. The biggest and most popular are actually located at the base of the mountain. However, it can be more fun to search down the small pathways, leading off the mountain road, to ‘secret’ shrines with grand views of the countryside. Don’t forget to stop by the Victoria Resort in the late afternoon for a cocktail at their sky bar looking over to Cambodia. 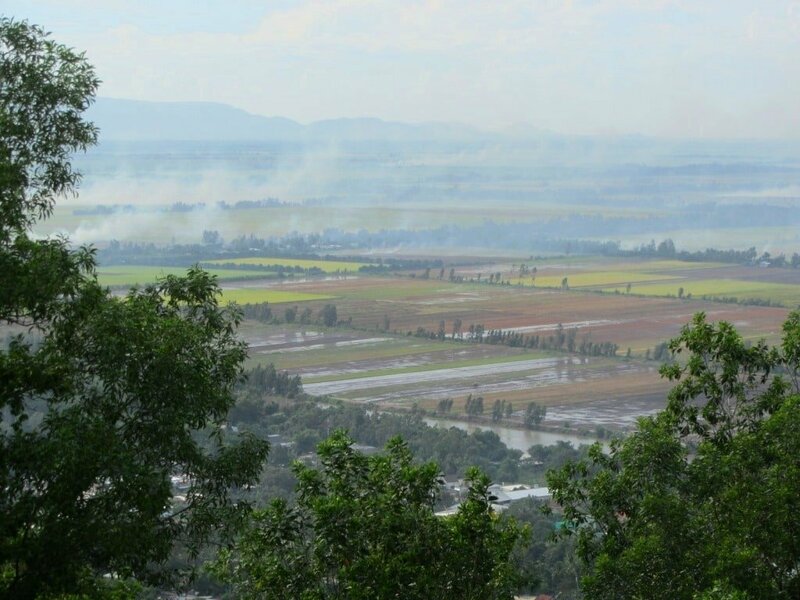 Just a few kilometres from Nui Sam Mountain, Chau Doc is a scruffy but energetic city on the Mekong River. Its central market is a great place to wander around and try out all kinds of snacks (try the bún cá; fish noodle soup). Chau Doc has a fascinating cultural mix, thanks to a healthy Chinese and Cham population; the latter follow Islam, and their calls to prayer can be heard drifting over the Mekong from the mosque in Chau Giang hamlet. Murray Guesthouse is a superb outfit just out of town ($30), or if you want to splurge on some colonial charm, head to the riverside Victoria Chau Doc ($100). 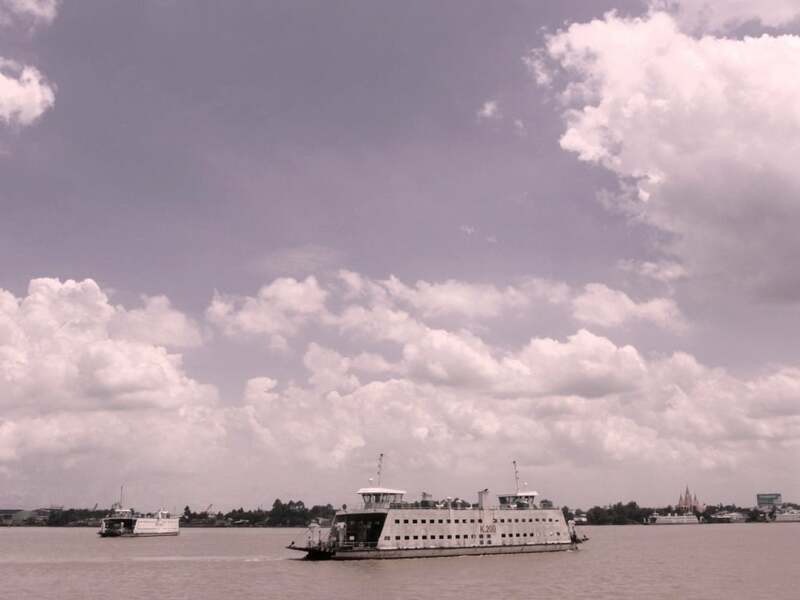 Take the ferry across the Mekong from Chau Doc to Chau Giang hamlet on the north bank. 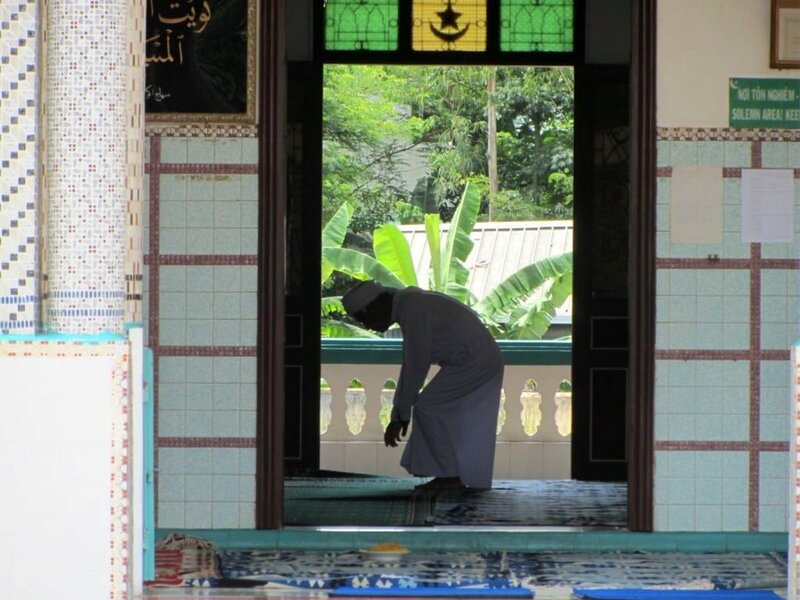 Immediately after the ferry there’s a bright white mosque, which serves the Cham community here. The Cham Empire once ruled much of what is now Vietnam. Originally Hindu, then Buddhist, by the 17th century the majority of Cham people were Muslim. By this time, the Cham Empire had been defeated by the Vietnamese, and its people were pushed gradually further and further south; hence the Cham enclave in An Giang Province today. Road TL953, following a canal, is full of wooden push-carts, selling fresh fruit and vegetables, and cooked food. It’s very unusual to find so many old-style carts like this in one place; it’s like stepping back 20 years. I found it hard not to stop every few minutes to try all the snacks they were selling. The roadside is lined with herbs, leaves, spices, coconut husks, fish, and laundry, all drying in the sunshine. At the sprawling and attractive riverfront promenade of Tan Chau, it’s tempting to stay at the Song Lac Hotel (199 Tran Hung Dao; 0763 596 789), looking over the broad sweep of the Mekong, and spend a day exploring the tree-shaded backstreets and lively food scene. You won’t find any other foreign travellers here. A ferry from Tan Chau (the last crossing of this road trip) takes you over the Upper Mekong River to Dong Thap Province. 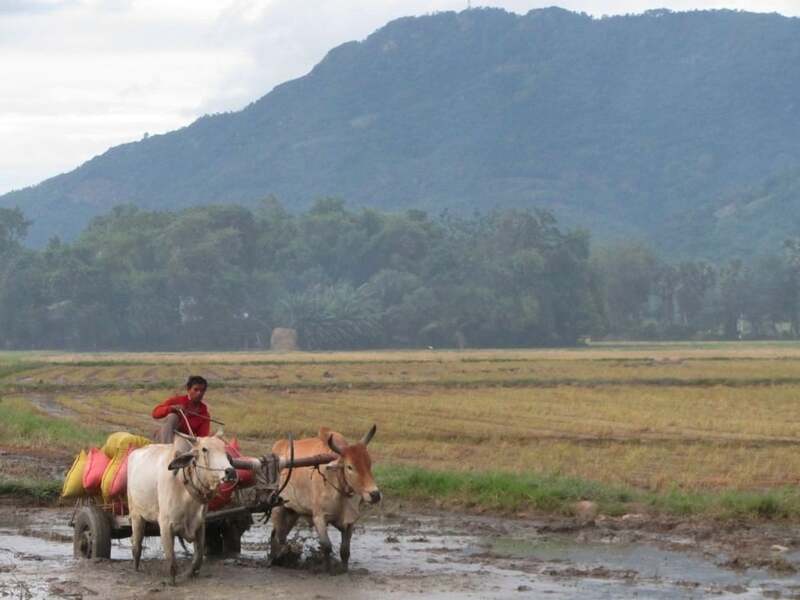 The landscape is flat and filled with rice paddy, with huge rainy season skies bubbling above it. 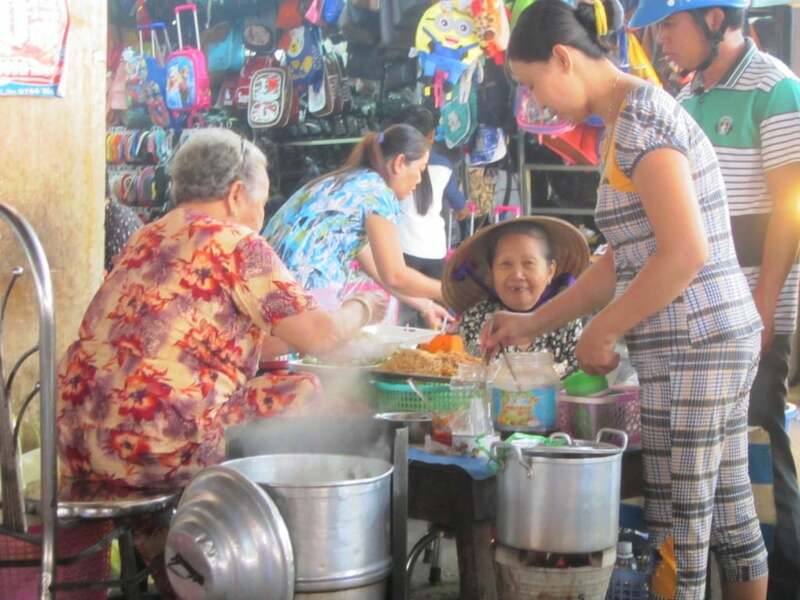 Hong Ngu, seldom visited, is another classic, busy Mekong Delta town, full of food and commerce. Try the delicious rotisserie meats across from the market. There are a handful of hotels and guesthouses (nhà nghỉ) here if you need them, including Mai Khanh Hotel, which offers good, clean rooms for $10 a night. About half an hour south of Hong Ngu, turn left (due east) onto Road DT844. This is the ‘shortcut’ back to Saigon: an arrow-straight, canalside road, leading through miles and miles of rice and corn fields. It’s an easy ride with little traffic. After an hour it can become monotonous, but it’s a lot better than taking Highway 1. The road passes several workshops specializing in making the wooden canoes which ply the tea-coloured canals in this area. Stop for some sữa sen, lotus seed milk, at one of the shacks by the road. Also, Tan Thanh has an appealing riverfront strip where you can break the journey with a coffee or a smoothie by the water, watching the boats. After Tan Thanh, you join what is the southern extent (so far) of the Ho Chi Minh Road. However, on most maps it’s marked as Road QLN2. 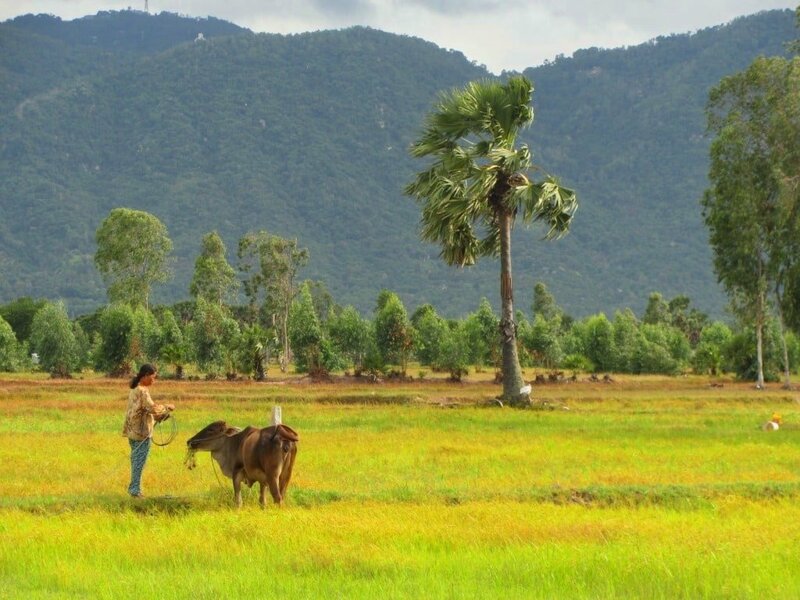 This whisks you up through a quiet but unremarkable landscape to within kilometres of Saigon. But, just when you think you’re going to sneak into the city unnoticed, you hit dreadful Duc Hoa. Industrial estates, trucks, dust, pollution: welcome back to Saigon! When you reach Highway QL1A, it’s best to head south to the turning for Vo Van Kiet Street, and enter the city from there. As always, once back in Saigon, the memories of the last few days on the road immediately seem far, far away. 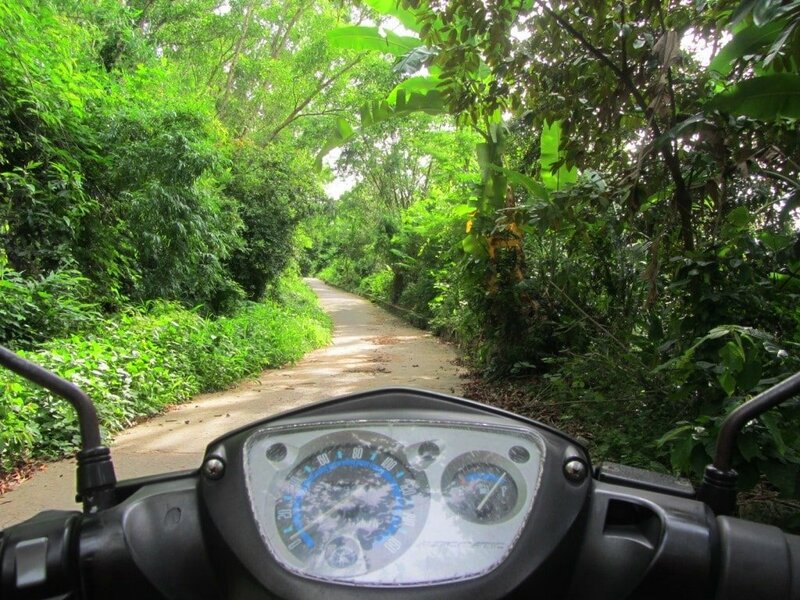 This entry was posted in ALL, Mekong Delta Motorbike Routes, MOTORBIKE GUIDES, Mountains, The South and tagged An Giang, Chau Doc, delta, guide, Mekong, motorbike, mountains, nui sam, Oc Eo, travel, Vietnam. Bookmark the permalink. I love your ideas and I did already several loops in the North! Now I am in Saigon, and I would like to do this loop between the 1st of January and the 5, how many days do I need for sections 1 and 4? Can you help me to choose the steps on 5 days please? Can I find cheap Homestay along the entire road? And last question, where can I rent a motorbike for a good price?! Thank you very much for every adventure you share! 5 days is fine for this route. Sections 1 and 4 can been completed in one day, but it would mean spending the whole day on the bike, so you would need to leave in the morning. For accommodation, please see the description for each section where I have included some specific recommendations for guest houses along the way. But wherever you are, you can usually find local nhà nghỉ (guest houses) in most villages and towns – more about that here. Oh, and for my recommendations for bike rental, please read this. 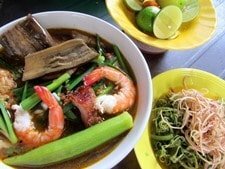 Do you have any you’d recommend in Saigon that wouldn’t be too expensive? Personally, I would go to one of the official franchise garages for your motorbike’s brand: for example, there are lots of Honda, Yamaha, SYM garages in towns all over the country. It might cost you some money, but it’s worth it for peace of mind while you’re on the road. Just finished section 2 of the route, really beautiful scenery and easy to follow – thanks! 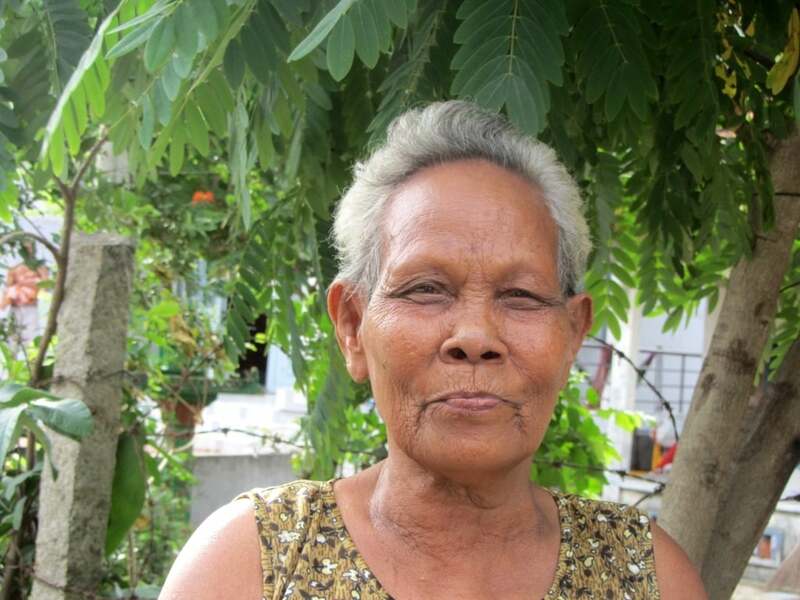 Would recommend staying at a homestay on Cu lao my hi hung – the island directly to the east of Long Xuyen (1 short ferry) – beautiful views over the river and lovely people. Question: my scooter struggled quite a bit on the climbs up to the Nui Sap and Nui Ba The (needing a push at the steepest points of both). I was intending to do something similar to your classic route from Saigon to Hanoi very soon. Are there climbs as steep as that on the route? If so I’ll obviously have to rent a better bike. Thanks, the homestays sound really interesting – I’ll check them out next time I’m in the area. Yes, there are some pretty steep climbs on the Classic route. It might just be that your bike needs a good service though – if you take it to a good garage and explain that it struggles on steep hills they should be able to do something for you. Awesome site, I used a lot of your routes. I currently live in the Delta and most of the roads you describe here as bad are now in a very good condition (so that’s good news!). Last weekend I was at Oc Eo mountain again, what a beautiful (and underrated!) place. I think you should include one of the forests on this route as well: one of Tra Su or Tram Chim should be a must visit. Thank you for the updates – it’s good to hear that the roads are in good condition now. Yes, I agree about the forests, Tra Su, in particularly, is very nice. hi, I am very interested in driving the mountains in the mekong route or to pho quo. You site is amazing and very detailed, inspirational. I am trying to figure out the best way to draw up maps or a list of roads. I have no clue of the best approach to navigating. Would I need gps, or is it easy to find your way by road signs? Is there any maps I can buy, I am really lost just getting started with planning. I have tried to use the interactive map you provide to map my route but find it overwhelming. Do you have any advice? Thanks for your time and your dedication on creating this web page. Take at look at this guide – it’s about how to use maps in Vietnam and what maps to use. What an excellent site! I would use it over any other site or guide books for Vietnam, and is a pleasure to read. I live in Cambodia and will take a bus to meet a friend in Saigon next month. We plan to buy cheap scooters there and do the mountains in the Mekong trip up to Chao Doc then double back to Ha Tien and cross back into Cambodia. 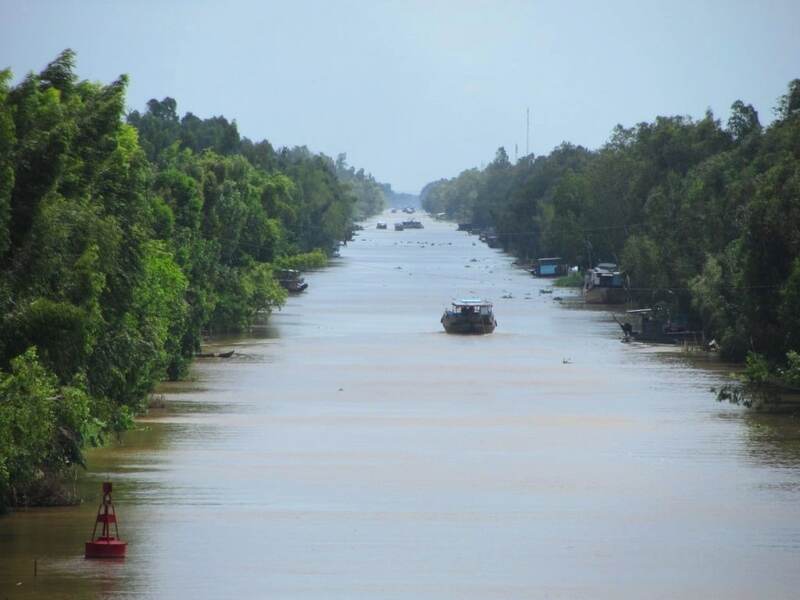 We will spend around a week or so and will spend our first night in Ben Tre. I was wondering if a departure from Saigon on a Sunday early afternoon would make any difference to the awful traffic getting out of the city. As opposed to a normal weekday? Yes, leaving on a Sunday (at any time of day) will likely reduce the ordeal of traffic and smog while exiting Saigon. 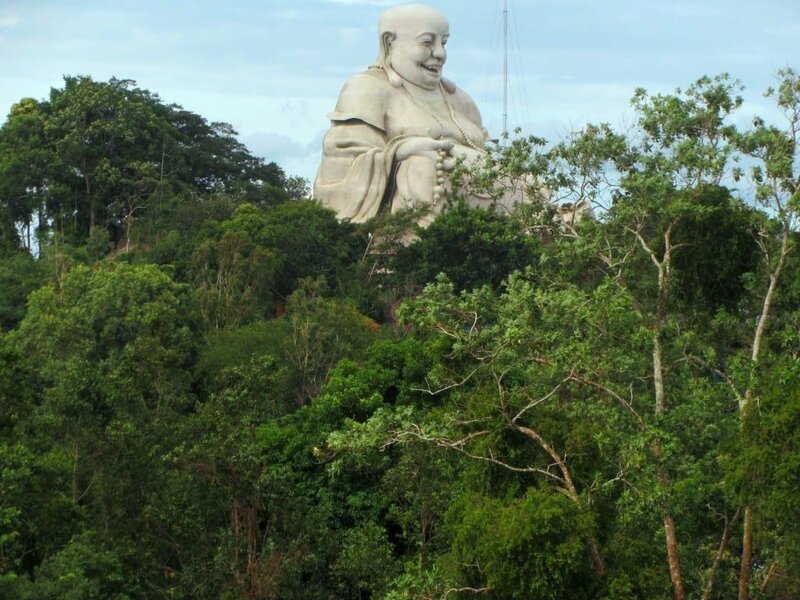 For more information about Ha Tien, take a look at this guide. Just went back from this trip, I loosely followed your instructions but mostly did the same things. Once again you were a great guide with fantastic advice. It’s good to have someone as dedicated as you to share advice with lazy roadtrippers like me 😉 However I kinda rushed it in four days, I should have made it five to take the time to enjoy the western front of the trip. Looking forward to follow another of your guides! Great to hear that you rode this loop. Yes, it’s quite a long way for a few days, but still a rewarding ride, I hope. I’ve just found your website and i’m so happy to read it. Do we have a driver or can i drive by myself? Let me know what is possible to do ? We arrived in Saigon in 08/2015. I love to drive my scooter discover Vietnam first close to Saigon. But now i want to go more in the countryside . 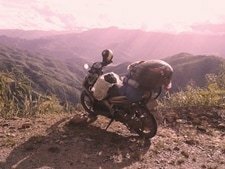 Yes, you can drive your own scooter on the Mountains in the Mekong route. For information about how much a road trip in Vietnam costs, take a look at my Expenses Guide. I just arrived at Nha Nghi Ut Map (Oc Eo). The lady there is so sweet. I tried my rusty Vietnamese and asked for the price and she said slowly “Mot tram bon muoi” (140k) with a big smile. The family doesn’t speak a word of English but they are lovely and tried their best to make me feel comfortable. They even let me park my motorbike straight in the room with me. Haha. I wasn’t expecting that. Great guide! Going to Tri Ton and Nui Cam tomorrow. Thank you so much Tom! I actually meant IN the room (like next to the bed). Haha, first time. Thanks for the update about the road. We visited this spectacular area with a friend of mine last week. What a difference to Sai Gon’s traffic nightmare! The hills provided great views at an altitude while the market in Tri Ton and the forest loop around Tuc Dup mountain were the highlights of the journey at the lower end. We are now thinking about doing the Tet Classic over the Lunar new year holiday period with another friend. I’ll read your post on that, would you mind if I came back with some questions later in case I have any? Your blog is an excellent knowledge base for independent travellers, thank you for every post. Great to hear that you enjoyed the loop. I happen to be there right now actually 🙂 Just about to go and enjoy some breakfast at the market. We are interested in the Khmer culture and the landscape of this region. But, we are not motorbikes as I mentioned in another post so would have to find another way to get around. 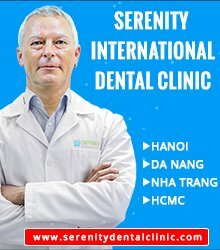 Is there a tour company you would recommend that operates out of HCMC during Tet that you like and find to be reliable + great quality? Yes, you can certainly visit the places you mention during the Tet holidays, but be prepared for crowds of pilgrims and tourists. I would expect Nui Cam and Nui Sam to be jammed full of people praying for good luck, fortune, health and wealth for the New Year. Of course this is a spectacle in itself but it can also be overwhelming. But as long as you’re expecting it I’m sure you’ll enjoy it. I’m pretty sure the Khmer New Year is not the same as the Vietnamese because they practice a different branch of Buddhism, so visiting the Khmer temples which dot the area shouldn’t be a problem. I think Chau Doc has some local tour operators – Victoria hotels can arrange trips, for example. Otherwise, you’ll probably need to work something out from Saigon – my friends always use Buffalo Tours and have only had good experiences with them. Just be specific about what you want from them. If I weren’t heading back to America later this week for a couple months, I’d be heading straight for the Mountains of Mekong. Thank you for another incredibly interesting article. 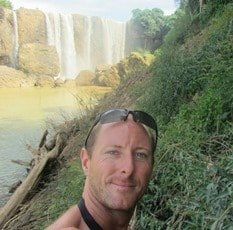 I’ve lost track how many times I’ve recommended your web site to others, mostly backpackers I meet here in Da Lat or in Saigon. Please keep traveling and writing for us. I’m looking forward to your next post. Great to hear that you’re enjoying my guides. And a big thank you for recommending them to other travellers – that’s a great help to me (and the travellers too, I hope). Enjoy your time back in the States, and I hope you get the chance to ride the Mountains in the Mekong loop sometime in the future.